Friday May 3 from 10pm to 1 am, you are invited to attend the live Ask Dr. Hal radio show at Radio Valencia, 2390 Mission, Suite 302, San Francisco or listen in to the broadcast on 87.9 FM or http://radiovalencia.fm/. The phone line is (415) 962-7979. 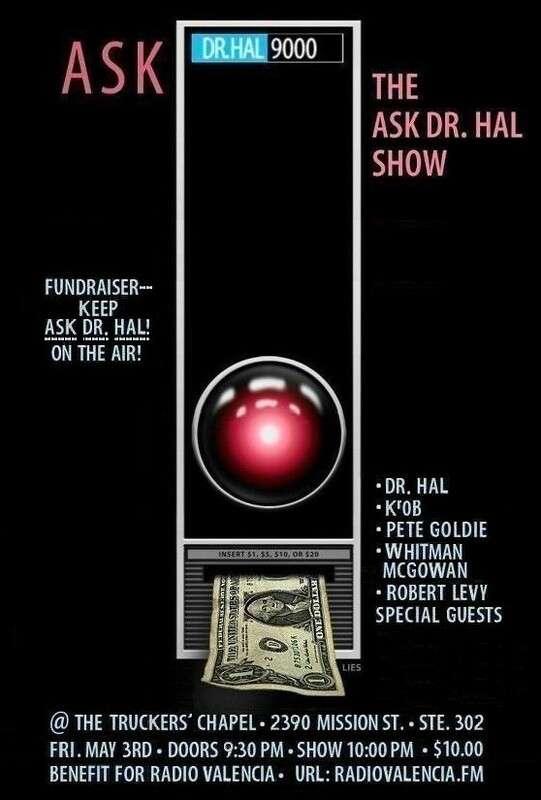 This is a benefit for the weekly Ask Dr. Hal show on Radio Valencia. I will be a featured performer, and I plan on debuting a sharp new jazz soundtrack created by Hollywood film and tv composer/arranger William Ashford to accompany my rather droll Father Earth piece. Help me celebrate the last echoes of Earth Day fortnight and help keep Dr. Hal on the air!.